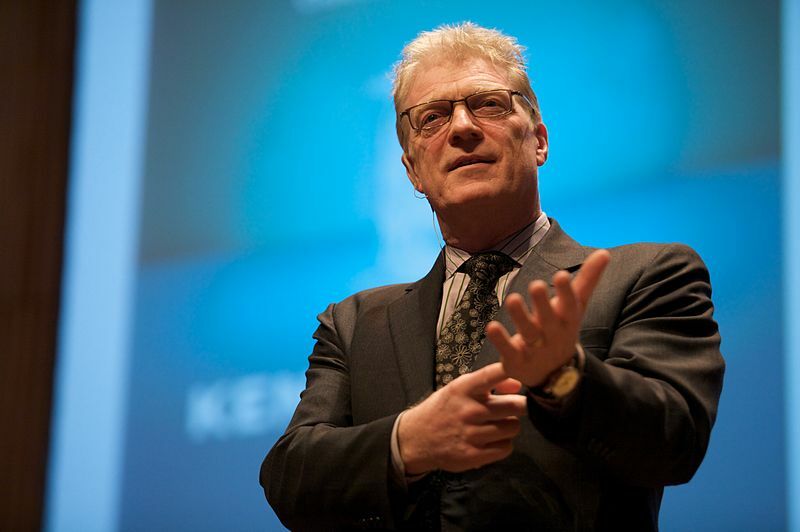 Anyway, back to Sir Ken Robinson. Having watched his two TED talks, the RSA animate video he narrates, and recently read his book The Element (as mentioned in a quick review yesterday), I pretty much knew what to expect in terms of the content of his talk. Many of his ideas and anecdotes have been presented before, and I suppose that’s inevitable once you become a famous author. Even so, I felt like I got a lot out of this presentation and discussion, and was thoroughly engaged the entire time. I jotted down some quotes and notes during the talk, and will try to decipher these into coherent thoughts. This is one of Sir Ken’s most frequently cited suggestions, and with good reason. Many students are disengaged and uninterested in learning because they’ve been presented with an Industrial Age one-size-fits-all model of education. Sir Ken referred to mainstream education as riding the ‘rails of conformity’, a phrase which brilliantly illustrates the convergent nature of our systems as well as alluding to the railway, perhaps the most recognizable and enduring image of the Industrial Age. In the digital age, we have the tools and capabilities to bring education back to its roots, so to speak, allowing learners to pursue their passions and develop themselves as human beings, rather than cogs in a system doing “clerical work”. Similar to the argument presented towards the end of The Element, Sir Ken points out that human beings are organic rather than mechanistic creatures, and our systems of learning should reflect this obvious fact. It is tough to break old habits, and the remnants of the mechanical age are no exception. Our manufacturing, transportation, city structures, and yes, even our education systems were built on the backbone of the Industrial Age. We’re transitioning into the digital or electric age, and these types of transitions are disruptive. Marshall McLuhan noted in the 60’s that as we shifted to living in proximity to our neighbours through the instantaneous connections of the electric age, we were returning to a tribal culture unseen since preliterate man. Could it be that the electric age of television, computers, and the internet is actually more natural and organic than the mechanical age of factories, steam engines, and railroads? 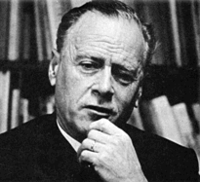 Marshall McLuhan in the early 1970's. In 1964, Marshall McLuhan wrote that “We live today in the Age of Information and of Communication because electric media instantly and constantly create a total field of interacting events in which all men participate.” And he wrote this thirty years before any of us had ever used the Internet! He goes on to explain that “electricity is organic in character and confirms the organic social bond by its technological use in telegraph and telephone, radio, and other forms.” Much of McLuhan’s work was built upon the idea that each new technology is an extension of man, and the discovery of electromagnetic waves extended our central nervous systems beyond our bodies. If this is so, then Sir Ken’s suggestion to return to more organic metaphors for learning make perfect sense. The digital age provides us with the means of communicating with more speed and precision than ever before, and we’re truly becoming a global village – with the ability to view (in high definition) events happening around the world. We’re not becoming dehumanized by our technologies, we’re simply being provided with an improved means of communication which is actually more natural and organic than we might think at first glance. As McLuhan so poignantly said: “The simultaneity of electric communication, also characteristic of our nervous system, makes each of us present and accessible to every other person in the world.” In my opinion (which is quite contrary to McLuhan’s pessimistic view), this extension of our nervous systems and the improved communication that comes with it are great steps for humanity, and we should be embracing them in our classrooms. Sir Ken contends that in education, we “create problems not deliberately but systematically” which results in an “embedded structure of the curriculum” in which we segregate subjects, create disciplines, and then arrange them in order of importance. (His words remind me of Neil Postman at times.) He told an interesting story about a girl (I think it was his daughter but I might have missed that) who after finishing a dance class was asked “What did you get out of this class? Did you gain from the experience?” to which the girl replied, “I got a B.” We’ve come to create a culture in which standards and grades are more important than personal growth and development, and the kids don’t know any better. What would John Dewey think? Sir Ken ended the night with a quote from H.G. Wells which emphasizes the importance of transforming education: “Human history becomes more and more a race between education and catastrophe.” The optimist in me wants to think we’re making great strides in the digital age, and that inspirational speakers like Sir Ken Robinson are leading the way for education to win the race, leaving the McLuhanesque pessimism predicting catastrophe in the dust. Thank you Sir Ken Robinson for the engaging and inspirational talk last night. I like the idea of personalizing education, but I have difficulty finding a great way of implementing this personalization which both benefits the student and fulfils the goals of their education. On your question on our recent technology being organic and natural, I find it difficult to believe so. Although it is very organic and natural in the sense that it gets people talking again, it does so in a very abstract way. Quite often it seems to take the other person out of the conversation. The conversation gets dehumanized to a collection of ideas. I don’t know if I could call this more organic or natural. Your statement about education being all about the relationship between the teacher and the student, does that mean that teachers are a required part of education?